Finance Transformation has been a catchphrase in the enterprise performance management (EPM) industry for several years. But what does finance transformation mean exactly? From our perspective, it begins with the marriage of modern, digital technologies with a strong governance philosophy. When this occurs, a finance organization is transformed into a prescient voice shaping business strategy. Leading finance organizations today are deploying modern, digital technologies – social collaboration, software as a service, big data, in-memory processing – to get a handle on a tide of financial data that never seems to ebb. They are doing it while still enjoying the power and ease of spreadsheets. And they are doing it without placing excessive burden on IT personnel. They are also embracing the tenets of stronger governance. Once viewed as a nuisance, good governance yields real cost savings and value. For example, master data governance reduces time spent reconciling between systems. Data governance drives more automation, accuracy, and easier audits. And process governance enforces corporate standards while allowing flexibility within individual business lines or departments. One area where the combination of digital tools and governance yields real value is financial planning. 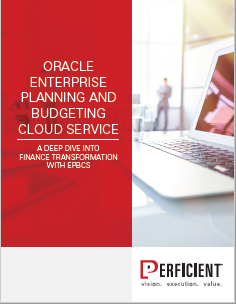 This whitepaper focuses specifically on financial planning and Oracle’s latest cloud offering in this space – Oracle Enterprise Planning and Budget Cloud Service (EPBCS). About Perficient: Perficient is the leading digital transformation consulting firm serving Global 2000 and enterprise customers throughout North America. With information technology, management consulting and creative capabilities, Perficient is an Oracle Platinum Partner with 15+ years of experience implementing cloud and on-premises solutions for EPM, ERP, BI, and CX and an authorized Oracle Education Reseller.